(and congregations) will enjoy it." Also listed in Sunday by Sunday as suitable for Trinity Sunday. This piece in four verses is available as a printed choral leaflet or as a digital download (PDF). It will give your singers a challenge that they will enjoy! The wonderful hymn tune Coe Fen was composed by Kenneth Naylor (1931–91), formerly music master at the Leys School, Cambridge. Both a choral arrangement and a final-verse descant are provided. This arrangement by Alistair Warwick sets the middle verses as a four-part choral version from the original (up to seven-part) organ texture. Verse two can be sung without organ if desired. Throughout the arrangement use is made of elements of Naylor's writing – especially the three-note motive "Eb G F" (the first three notes of the melody and its transpositions) – in order to bind it to the original. For verse four there is a sensitively understated descant to suit the text. Although six bars specify a double descant, it will work equally well with just the upper line. Experienced organists will naturally use the organ part in the last verse as a basis for their accompaniment. The hymn can, of course, be sung in unison without any choral contributions (the original organ part is included); indeed, the assembly is encouraged to sing the melody throughout. Although the music is copyright (see "Notes" about the use of this work), the text is in the public domain, so the words can be freely copied for use by your congregation. John Mason was born c. 1645 in Irchester, Northamptonshire, England (baptised in March 1646), and died 1694 at Water Stratford, Buckinghamshire, England (buried 22 May). 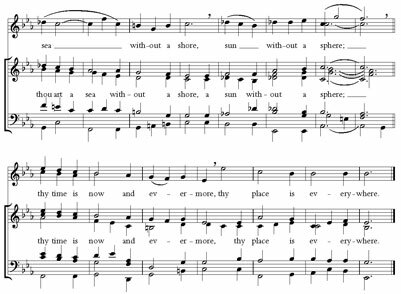 The text of 'How shall I Sing' appears as part of the first hymn in Mason's Spiritual Songs; or, Songs of Praise to Almighty God upon Several Occasions (1683). The original hymn, in praise of God, was based partly upon Psalms 103 (104) and 138 (139). My song is love unknown How shall I sing? What may I say? Who am I? Although this hymn has only entered the hymnody canon fairly recently, the text is treated in different ways: some books have only three verses for this hymn, conflating verses two and three, while others have a different arrangement of the text in these two verses. The solution offered here seems logical and to represent the author's intentions (see "The text" for the complete text). NEW: Print copies of the words (PDF) for your congregation. If you only have three verses in your hymnbook, you could ask the congregation to sing the first and last verses, whilst the choir sings the two middle verses. If your hymn book has the other order of verses and you want to continue singing it this way, you can mark up your choral copies so that they reflect what is in the hymn book. Print the words (see "The Text" tab) in your service sheet or newsletter. The text is in the public domain and freely copyable. 1. See pages 111-13 in Amazon's Book Preview for more background to this hymn text. "splendid arrangement … I feel sure many choirs (and congregations) will enjoy it." "Your edition fits my needs perfectly. Thank you so much for the edition and your prompt service!" "What a great tenor line!" "We premiered your setting of 'How shall I sing...' on Easter Sunday and it went down a storm. The choir love it, especially the altos who are delighted not to have endless strings of one or two notes!" This arrangement of Coe Fen is made under licence from Oxford University Press (OUP) who own the copyright to the original tune Coe Fen, and thus any arrangements of the work. Any requests for sublicensing should be made directly to OUP music.enquiry(at)oup.com (this includes inclusion in any other publication, recording, broadcasting, or public performance outside worship). Please send us a copy of your request (copyright(at)theartofmusic.com). To enable us to receive the appropriate royalties from further use of this work, please make clear in any negotiations with OUP that it is this arrangement that you wish to use, quoting "Naylor, arr. Warwick: Coe Fen, published 2006, The Art of Music". Thanks! See "About the text" for an explanation of the verses. Alternatively, if you only have three verses in your hymnbook, you could ask the congregation to sing the first and last verses, whilst the choir sings two verses in the middle. Since the text is in the public domain, you could also print the words in your service sheet or newsletter.